Be the first to know when our application window opens each season! Receive updates about openings at the market.  Sunday Farmers' Market at College View, previously Old Cheney Road Farmers' Market, has over 60 member-vendors. Our vendors are farmers with pastured meats, seasonal produce, cut flowers, and plants to farmstead cheese makers and honey producers, gluten-free or vegan bread bakers, and specialty processors with wildcrafted wreaths, jams and salsa. Our customers come for lunch and a coffee and stay to grocery shop for the week. Consider joining our community as one of our creative and dedicated vendors.